Beautifully handcrafted British made gifts for him. Finding a gift for the man in your life, be it Dad, brother or husband is never an easy task. But buying a gift that he will cherish is even harder. 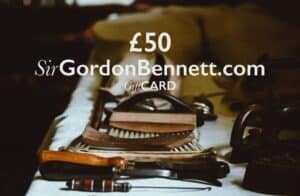 Here at SirGordonBennett.com we purvey specially curated products that people will not only want but love. From brands that care deeply about the products the make. That look beautiful, are made better, work as they should and are made right here in Great Britain. But if you are looking for something rather special for the Ladies in your life? Click to see Sir Gordon's gift ideas for her.